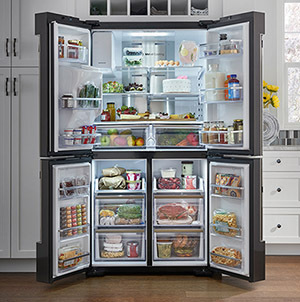 What do you need a smart fridge for? It’s a great question and one I’ve heard more than a few times since getting the Family Hub smart fridge on loan from Samsung. It’s hard not to see a lot of what the Family Hub does as gimmicky, especially when the fridge is set up in your office for a trial and not in a typical home usage situation. When it’s set up in your home and connected to all your other devices, the Family Hub becomes more than a fridge with neat tricks. At its most basic, the Family Hub is a big fridge-freezer with a 21.5” touch panel stuck to the front. This panel controls functions, such as setting temperature zones, but it also does everything you’d expect from a regular tablet. You can browse the internet, listen to the radio or stream music. You can even watch YouTube, which is pretty cool, though at first glance not especially useful. But being able to watch videos while you’re cooking is more than a way of keeping the kids occupied. You can put up cooking shows or instructional videos. Using a built-in app, I watched a short clip on cooking techniques, a useful feature if I needed a lesson while whipping something up in the kitchen. If you have a recent model Samsung smart TV you can mirror the screen on the fridge, so you won’t miss a moment of the game while you’re making nachos. 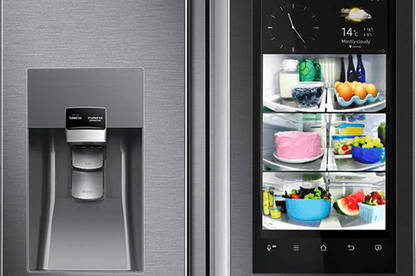 Apps allowing you to write lists or notes on the fridge are possibly the best tech feature of the Family Hub. There are a few different apps but they all let you do the same thing: leave big notes on the screen for others to read. This digital version of a notepad stuck to the fridge door has the added value of being able to send messages from the fridge to an associated phone (and vice versa). My workmates even sent me a birthday message via the fridge. The most useful features are the shopping list app and the internal cameras. You can’t take a selfie with the fridge but one of the doors has cameras mounted in it so you can photograph what’s inside remotely. Again this seems like a gimmick, until you’re in the supermarket and trying to remember if you already have mustard. The Food Reminder camera app lets you assign use-by dates to food, which pop up when you need to replace items. You can access the separate Shopping List app from your phone. So if someone at home adds a last-minute item, it immediately shows up. Overall, the Family Hub feels like a solution to a problem most people don’t have. 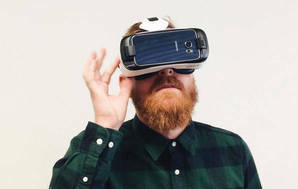 However, in the future, a connected fridge inside a connected home could order food for you via an online store, record your favourite cooking shows and suggest recipes based on what food it can “see” with its cameras. Right now, though, it’s a fancy and expensive, fridge. This fridge was loaned to the writer by Samsung New Zealand.